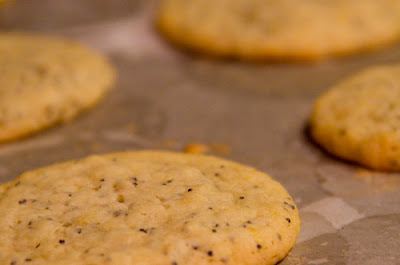 These Lemon Poppy Seed Cookies are a great summertime cookie! The fresh lemon zest gives these cookies a bright yummy taste! Pre-heat oven to 350 degrees. Beat granulated sugar and butter in large bowl until creamy. Beat in egg and lemon peel. Combine flour, baking soda and salt; gradually add to butter mixture. Beat in poppy seeds. Drop dough by heaping teaspoonfuls and bake 11 to 12 minutes or until edges are lightyly browned. Makes about 2 dozen cookies. Opps! I wonder how they would come out without flour! Probably a bit more like brittle or something.Glad to know someone out there is keeping an eye out! And I do notice that you are watching over us! Thanks!